Knowing how to put together a routine appropriate for your skin isn’t easy; I should know because I’ve learned a lot from making mistakes over the years (and I’m still learning!). So in this article, I’m going to outline – in detail – the process of building your own skincare routine. There are many things that comes to mind when I think about this topic. First, I believe that to tailor a specific routine, you need to look at more than just your skin condition and needs. Indeed, your lifestyle, ethos, the time you want to devote to this ritual are all relevant criteria to take into account. Minimalist/Maximalist approach: whether you prefer a simplified routine or are adept of the layering method is up to you and what feels best for your skin. I will take both approaches into account whilst writing this article. 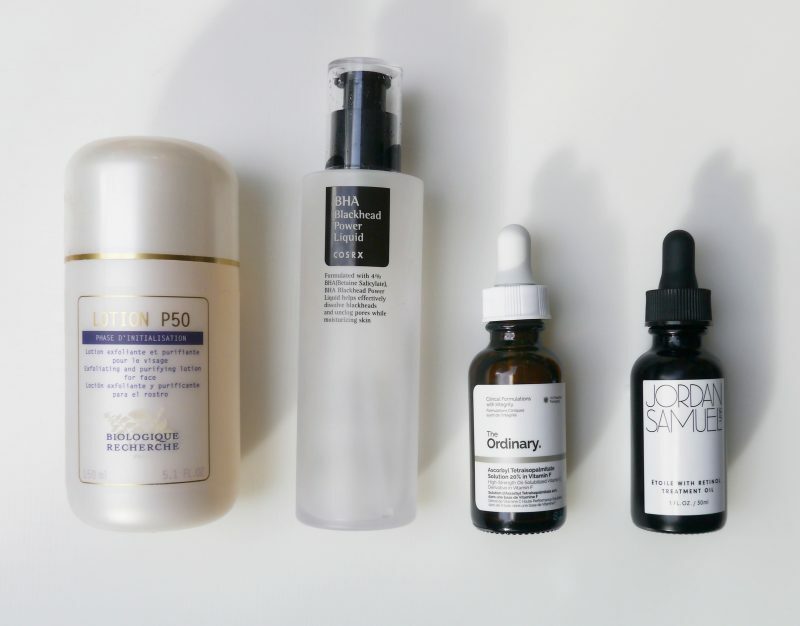 Skincare wardrobe: as I’ve mentioned in this article, I believe having an edited collection of skincare products is the answer to our evolving/fluctuating skin condition. Classifying people by skin types is an outdated approach (although helpful to have a general idea of what to look for in a product). It doesn’t take into account your specific needs of the moment. I prefer to assess my skin condition on a daily basis* and treat it accordingly. *The risk here (a mistake for which a lot of skincare addicts fall for, myself included!) is to change routine/products too often and not be patient enough to wait for results. Also, when playing the expert and using magnifying mirrors, we can sometimes see things that don’t even exist. I think there’s a learning curve to it. Nowadays you can find almost all product types offered in different galenic formulations (liquid, gel, milk, cream, oil, balm…). Choosing each product will depend on the texture you personally prefer and your skin needs. To support skin health, there are three essential steps anyone should follow: cleanse, moisturize and protect. Honestly, that’s it if you want to maintain good skin with a quick routine. First, cleansing the skin is necessary to remove excess sebum, impurities, dead skin cells and pollutants (basically all of the grime you’ve accumulated). Plus, it enables the rest of your products to actually penetrate into the skin, and so to perform better. In the morning, I like to do a quick skin cleanse whereas at night I double cleanse so that I first remove makeup/sunscreen and then cleanse my skin. The most important thing for this step is to look for a non-stripping option (free of harsh surfactants such as sulfates) whatever texture you prefer. This way you cleanse without damaging your skin barrier. Look for mild surfactants in your cleansers. Moisturizing helps to strengthen the skin barrier meaning that it keeps the skin hydrated and able to play its defense function. If you think about it, one of our skin’s main job is to protect our body from dehydration and from outside elements and irritants. When the skin barrier is compromised, skin can become dehydrated and irritated. So moisturizing keeps the skin supple, hydrated and calm. 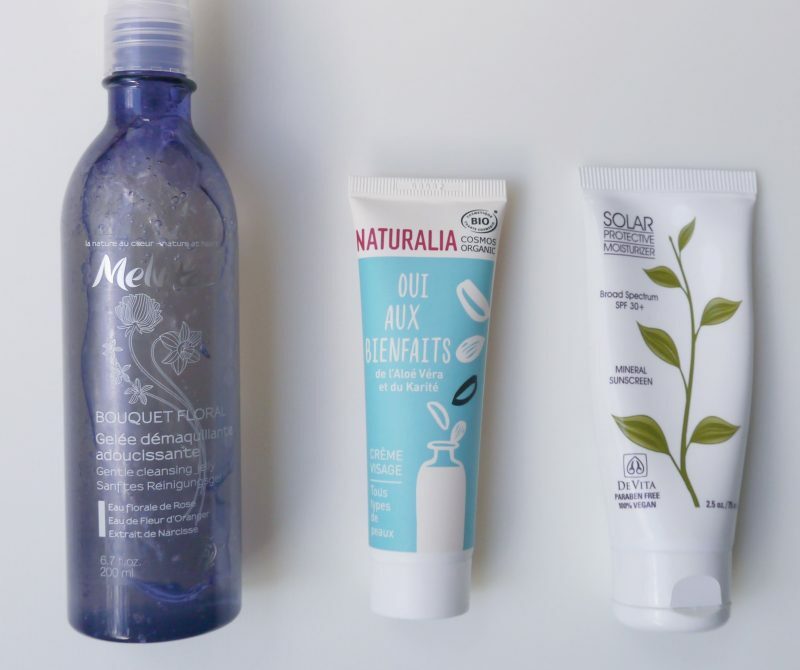 Moisturizers are made of mainly three types of components: humectants, emollients and occlusives (here and here are two great posts with further details on this topic). Basically, humectants (eg. glycerin, hyaluronic acid) help to retain water into the skin, emollients (eg. oils, ceramides) lubricate the skin and soften it and occlusives (eg. butters, waxes) form a protective layer on top of the skin. So humectants hydrate the skin while emollients and occlusives nourish it and prevent water loss. Humectants hydrate, Emollients soften , Occlusives form a protective film. Finding the right ratio depends on whether your skin err more on the oily or dry side but also on the season (in winter, I prefer a higher emollient/occlusive content). I think anyone can benefit from humectants since they tackle dehydration (and it might be all you need if you have oily skin). If you have drier skin, look for a moisturizer with more emollients and occlusives. Keep that in mind next time you’re shopping for a moisturizer! It will help you decrypt INCI lists to quickly know whether a product could suit you. The texture can also be a giveaway since the heavier the cream is the higher the emollient/occlusive content. Sun rays account for 8o% of the signs of aging (fine lines, wrinkles, pigmentation, sagging). This is part of extrinsic skin aging ie. environmental aging. So prevention and sun protection are key steps in any routine. That’s for the aesthetic part but, obviously, the first reason for applying sunscreen is to prevent skin cancer. There are two main types of sunscreens depending on the component offering the protection: mineral or chemical based sunscreens. Mineral or physical sunscreens contain mineral ingredients such as titanium dioxide and zinc oxide which work by forming a film on the skin that deflects and scatters sun rays. Chemical sunscreens, on the other hand, absorb and convert UV rays into heat and release them from the skin. Mineral sunscreens reflect sun rays. Chemical sunscreens absorb UV rays. Cosmetically, you can usually observe a difference in the texture and finish of the product. The non-nano mineral sunscreens tend to have a white cast and a heavier texture. Although, in that regard, chemical sunscreens appear to be better, you also have to take into account that a lot of people seem to react to them (myself included). So it’s a case of trial and error. I think that the most important thing here is to find a product you enjoy using so that it will become an everyday staple in your routine. So for the basic skincare routine, the minimalist approach would be to use three products for these three steps. For the maximalist approach (with varying degrees) it could go from 4 to 12 and more products (more on that later on). Actives are concentrated products that target specific skin issues (wrinkles, pigmentation, texture…). You insert them in your core routine to boost it. This would be the treatment phase. The main actives I’m going to talk about here (the ones that have been tested the most and have literature to support their claims) are acids, retinol and vitamin C.
When we speak about actives, we usually think about serums but they can actually be found in every skincare products. So what makes it an active then? It depends on the concentration of the ingredient. However, the higher percentage doesn’t necessary means the better. It depends on your goal, your skin sensitivity and the percentage where this specific ingredient was proven to be effective. Acids are chemical exfoliants that increase cell turnover, smooth skin texture (wrinkles and congestion) and brighten the complexion. They also enable the rest of your products to penetrate better into the skin (which is especially important for dry skin). The two main types of acids are alpha hydroxy acids (AHAs such as glycolic, lactic or mandelic acid) and beta hydroxy acids (BHAs known as salicylic acid). The difference is that AHAs are water soluble and BHAs are oil soluble. This means that AHAs are great for refining skin texture and for surface exfoliation whereas BHA is amazing for congestion and blemishes since it’s anti-inflammatory and able to get into pores to unclog them. Depending on the concentration, acids can be used daily or once a week. Retinol is the gold standard ingredient to tackle skin ageing. It works by increasing cell turnover and boosting collagen production. As a result, fine lines are softened, skin texture is refined and skin tone is more even – what’s not to love? Retinoids and retinol are derivatives of vitamin A. They are all converted into retinoic acid which is the form that’s recognized by the skin. The difference is how quickly this conversion occurs which will result in more or less irritation. Retinoids are only available on prescription. They convert directly into retinoic acid and can have a lot of negative side effects (skin irritation and dryness). On the other hand, conversion is slower for retinol formulas making them better for regular use and more sensitive skins. You can also find even milder versions such as retinyl palmitate or retinyl propionate. You should incorporate retinol slowly into your routine, using it a few nights a week and building up from there. I began by using a milder derivative and once I was used to it, I upgraded to a 0.2% retinol. I’m quite happy with the results I’m getting! Vitamin C helps to prevent and treat sun damage. It’s a powerful antioxidant that has brightening (helps fade hyperpigmentation) and skin firming properties (it stimulates collagen production). Most of the research on vitamin C is about the gold standard, L-Ascorbic acid. It’s the form that our skin recognizes. The problem is finding stable formulas because this ingredient is prone to oxidation, especially in water formulas (you most likely notice it with a change in color). More stable and gentle derivatives exist (such as ascorbyl palmitate, tetrahexyldecyl ascorbate, magnesium ascorbyl palmitate) that need to be converted into ascorbic acid to work. There aren’t a lot of studies yet backing them for the same claims as the ones attached to L-ascorbic acid. However, although they aren’t as potent as L-ascorbic acid, they do have similar skin benefits. I’m currently using a derivative and I find that it’s brightening my skin without being irritating. Here’s a table to recap the main effects of these three actives and what they are best used for. For the treatment phase, you should begin by choosing one or two actives to target your main skin concerns and stick with them to see results. 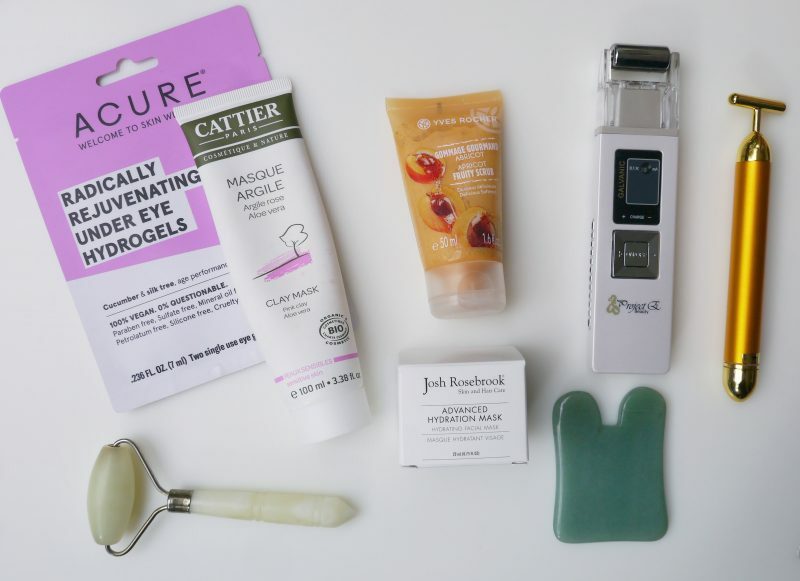 We’ve already tackled the skincare basics, so this final part involves the products you use from time to time such as masks, scrubs or the skincare gadgets you add to your normal routine. First, I want to quickly touch on scrubs. They are a form of physical exfoliation (using granules) that you usually use once or twice a week. However if, like me, you rely mainly on chemical exfoliants, this is a step you could skip. So it’s a matter of preference. I believe that acids are more effective and gentle. From time to time, I might feel the need to use a scrub but this doesn’t happen more than once or twice a month. Masks, on the other hand, are staples in my routine. I alternate between different ones twice a week. The good thing is that you can chose them according to your skin needs of the moment, some being deep cleansing, exfoliating, brightening, hydrating or nourishing. I view them as skin pick-me-ups. Finally, a trend you must have seen on social media is the increased use of skincare tools. They help to stimulate blood and lymphatic circulation, relax facial muscles and tone the skin. Between jade rollers, gua sha tool, vibrating wands or microcurrent devices, there’s a lot to choose from. I will write a more detailed article about the ones I’ve tried later on. For the time being, we only need to know that they are a great way to massage and tone the face. 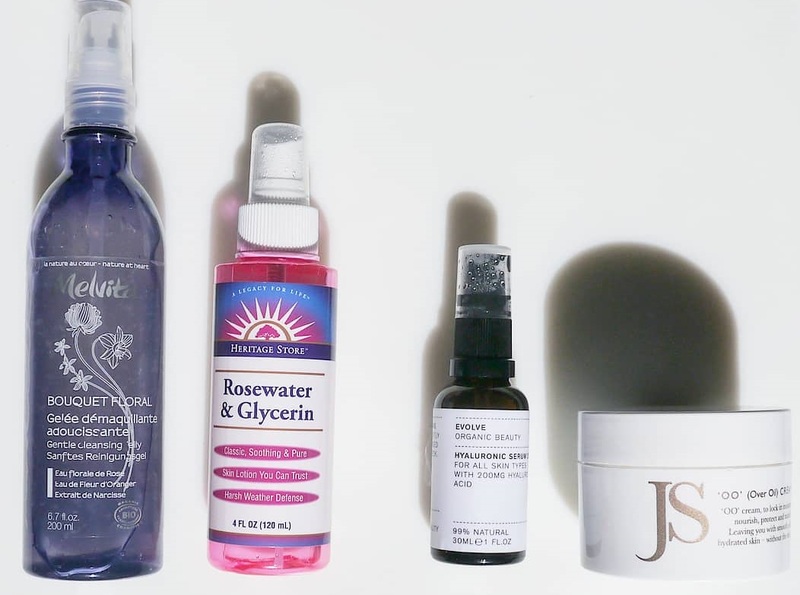 Now that we’ve looked into all of the components of a good skincare routine, let’s see how to put it all together. With so many actives, it can be hard to know when to apply them to get the best of them. I tend to apply antioxidants in the morning to boost the protection of my sunscreen from UV rays and environmental pollutants. 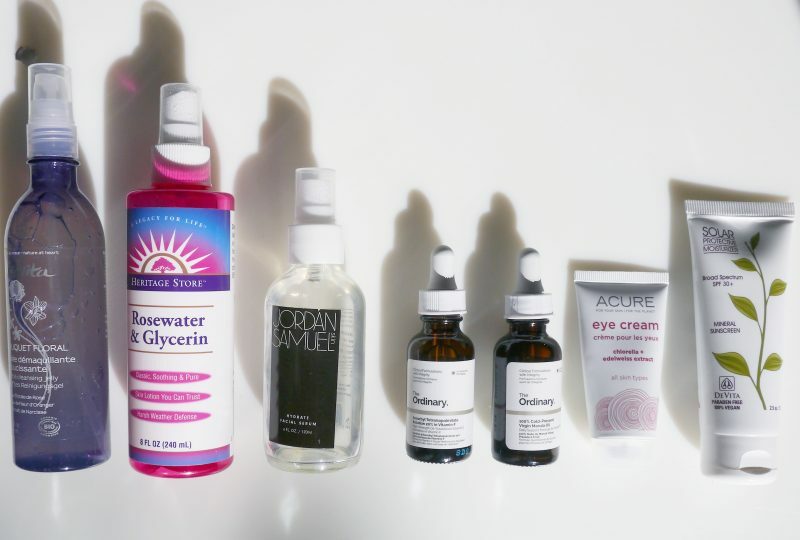 At night, I use the photosentisising products such as retinol and concentrated acid formulas (however, you’re fine if you use a mild acid toner in the morning). I prefer not to mix my actives to let each one perform best and prevent irritation, especially since most of them are great multi-taskers. For each step of your routine, look at the texture of the products you’ve chosen and apply them from the lightest to the thickest for better absorption. This way, every skincare product counts : they penetrate better into your skin and so they are more effective. Below, I’ve given AM and PM routines examples for a maximalist approach (you can remove the irrelevant products for your specific routine). Scrubs and masks would go after cleansing and before the rest of your routine. I’m not a maximalist for the sake of it. I’ve added products when I felt that they were making a difference (eg. builing layers of hydration works better for me on the long term). So it’s a trial and error process: everyone should determine what their skin responds best to. Regarding actives, I’m using all of the ones I’ve mentionned here (AHAs, BHA, retinol and vitamin C). 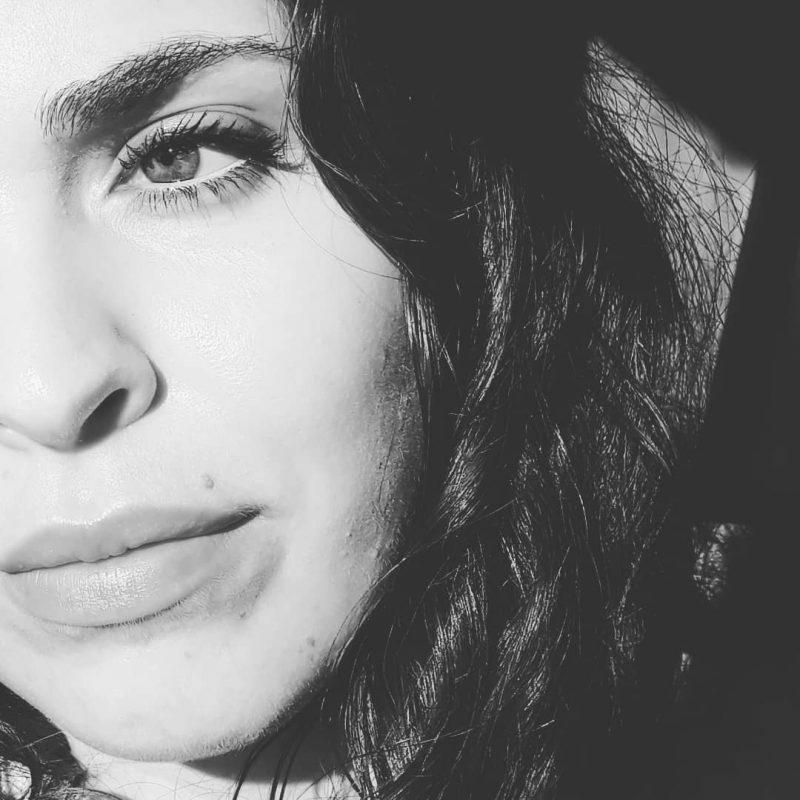 When I feel like it’s a bit too much for my skin or if I’m reacting badly to a new product, I always come back to a minimalist routine with products I know and love. For a look at my latest routines, follow me on Instagram @gayush_fr.